Over the past decade, our studio has had the amazing opportunity to work with a variety of nonprofit and charity organizations from around the globe in order to help support their causes. From helping to promote intergenerational civics literacy, to boosting entrepreneurship and financial literacy skills, and even fostering understanding and empathy towards underserved populations, our team has become experts at helping nonprofits harness the power of game-based learning as a means to effect real-world change. Unlike passive educational materials like brochures, websites, and videos, interactive media like games, simulations, and VR experiences provide a level of immersion unmatched by other media, resulting in lasting, impactful learning experiences. Virtual reality in particular has proven to be highly effective in helping evoke emotional responses among users, which in some cases has led to increased donation intent and awareness of certain charity brands. Perhaps it’s time your organization experiments with a custom-made VR initiative of your own? No ideas? No problem. To help get your creative juices flowing, we’ve curated a list of our favorite VR-focused initiatives from some of the world’s leading nonprofits. 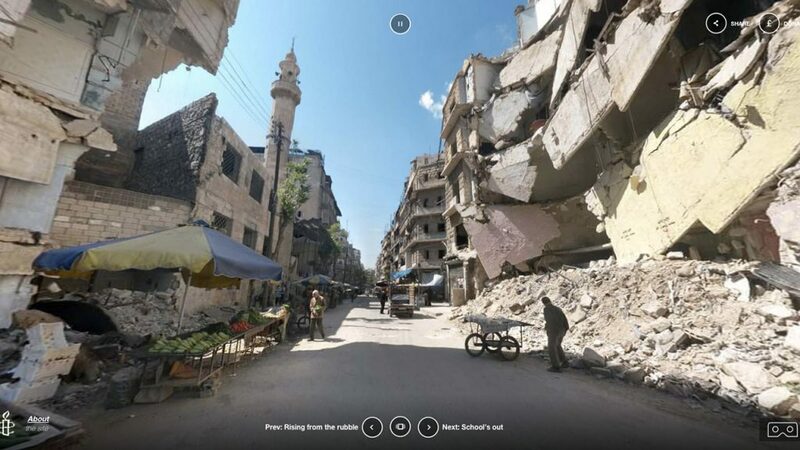 Check out the below examples for inspiration, and let us know if you’ve seen any other VR for impact projects that you feel are worthy of a spot on our list! The UK’s leading dementia research charity, Alzheimer’s Research UK has a clear mission: to bring about the first life-changing dementia treatment by 2025. While most of the organization’s work focuses on various research efforts, Alzheimer’s Research UK is no stranger to conducting widespread outreach and education efforts. One of their most noteworthy initiatives, A Walk Through Dementia, immerses users in the world of someone living with dementia. As users experience everyday situations like shopping at the supermarket or traversing their own home, they are also tasked with navigating common symptoms that pose challenges to folks living with dementia. Designed to help users gain a better understanding of the commonly misunderstood condition, A Walk Through Dementia serves as an excellent example of how VR can help cultivate empathy and understanding through impactful, long-lasting digital learning experiences. One of the world’s leading charities, Amnesty International UK exists to protect people wherever justice, freedom, truth and dignity are denied. United Kingdom-based charity the Resuscitation Council (UK) serves a vital mission: to promote high-quality resuscitation guidelines that are applicable to everybody, and contribute to saving life through research and education initiatives. One such program, Lifesaver VR, aims to accomplish these goals by helping citizens learn and practice life-saving emergency skills. A choose-your-own-adventure style interactive film, Lifesaver VR immerses users in a frightening cardiac arrest situation, forcing them to make life-or-death decisions in order to help a stranger in need. An exemplary case of virtual reality for learning, the game teaches players the correct speed and depth of CPR, universally applicable skills that have the potential to prove highly useful in everyday settings. So…feeling inspired? With these examples in mind, perhaps you now have a clearer picture of how VR could be used to support your mission. If so, we’d love to hear your ideas and exchange a few of our own – feel free to reach out to our team for a free consultation!